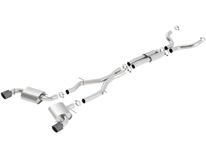 This system is intended for vehicles with significant upgrades that require a larger diameter exhaust. It is recommended for use with Long Tube Headers. This system features two carbon fiber tips with black anodized cores.